Apple has announced its new OS X 10.10 – Yosemite on October 16, 2014, which has a new interface combining freshness with familiarity and delivers newer user experience than the previous versions. In the meantime, making DVD backup on Yosemite also arouses attention. HandBrake 0.10.0 for Mac is a freeware that lets you convert various video types into MP4 or MKV format on Mac computer, while specifying a few other outputs. However, both HandBrake for Mavericks and for Yosemite are yet to work well on current Mac OS X. After free upgrading to the new Mac OS like Mavericks and Yosemite, many HandBrake users might find the incompatibility issue between HandBrake and Yosemite/Mavericks. It also holds back ripping encrypted DVDs and new movies. Besides, even if you are handling some old DVDs with new HandBrake 0.10.0 on obsolete OS X like 10.6, you are very like to be annoyed by its extremely slow conversion process, "taking longer to complete than the clip took to run". How to Fast Rip DVD on OS X 10.10 Yosemite? 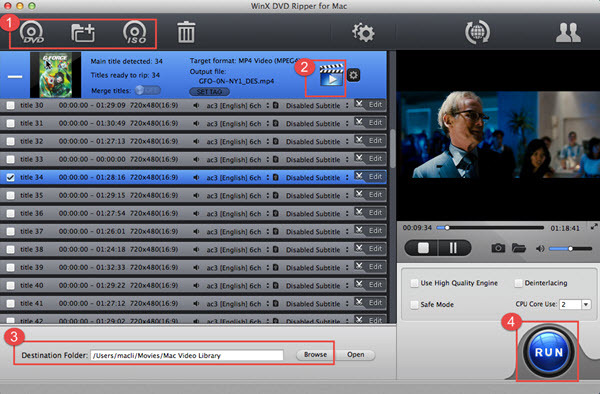 Best HandBrake Mac alternative tool to fast rip any DVD movies, including protected ones, on Mac OS X Yosemite. How to Make HandBrake 0.10 Rip DVD on Yosemite Faultlessly? WinX DVD Ripper for Mac Free: A 100% free HandBrake 0.10.2 alternative for OS X 10.10, capable of ripping common DVDs and regularly protected DVDs. It will always update for the operation systems of Mac, Yosemite is included for sure. Pros: Compared with HandBrake 0.10.2, it is easier to use, with more Mac-style UI, and is faster in copying DVDs. It is free without any foreign matters. Cons: Not in favor of strictly and newly encrypted DVDs. No enough profiles to meet the needs of increasing users. WinX DVD Ripper for Mac: It can be considered as the advanced version of the WinX DVD Ripper for Mac Free above. It rips even the latest protected DVDs DVD to MP4/H.264, iTunes, MOV, MKV, FLV, MPEG, AVI, etc. When getting the hang of it, you will find it faultlessly convert all DVDs (incl.) to iPhone5/5S/5C, iPad/Air/Mini (New), iPod touch/5, Apple TV, Android, Google New Nexus 7, HTC One, Samsung Galaxy Note 3/S5, Kindle Fire HD, WP8, PSP and so on perfectly on Mac OS X 10.10 Yosemite/Mavericks/Mountain Lion/Lion/Snow Leopard/Leopard/Tiger. Therefore, it is recognized as the best HandBrake 0.10 alternative for Mac OS X 10.10 Yosemite. Pros: Faster than common DVD rippers; support all Mac Operating Systems and computers; rip any kinds of DVDs, including Disney DVDs; has 350 profiles as the output video/audio/device formats. Cons: Shows no support for Windows OS unless the Windows edition is downloaded; not free. Here we just take ripping a copy-protected DVD on Mac OS X with WinX DVD Ripper for Mac as an example. Once downloading and getting the hang of it, you will find it is even a piece of cake for newbie. Just feel free to upgrade your current Mac OS to the newest version! Step 1. Install and launch it on your Mac Yosemite. Step 2. Input the source DVD disc, folder or ISO file (but you should make should it is already on your Mac). After that, click on the corresponding button on the top left of the software UI. 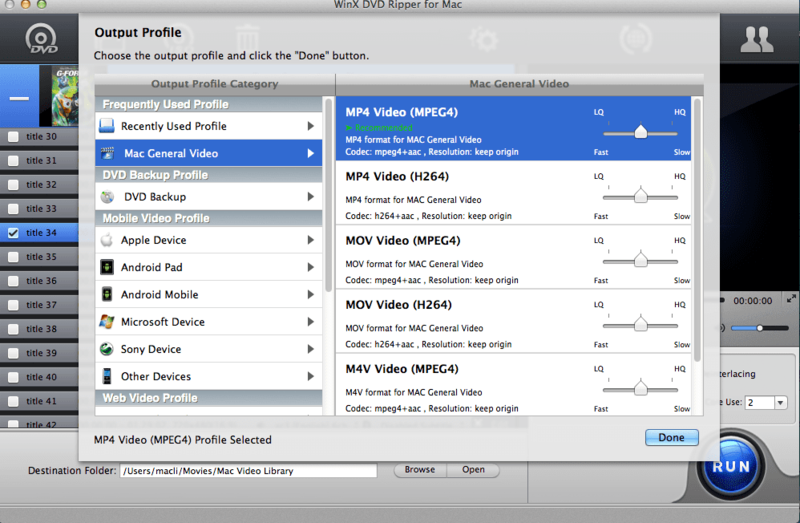 WinX DVD Ripper for Mac will auto check the main title of DVD for you. Step 3. Select any output format according to your needs. Without any personal settings of the parameters, you can rip DVD to iPhone, iPad, Apple TV, Android, MP4, AVI, MKV, MPEG, MOV, MP3, smartphones, tablets, PSP, WP8 and more on Mac. Step 4. Change the Destination Folder to where you can find the output files easily. Step 5. Hit RUN button to start the fast and stable DVD ripping on your Mac OS X 10.10 Yosemite or any Mac OS. You can stop the process at anytime. Need to rip latest Disney encrypted DVDs at fastest speed? WinX DVD Ripper for Mac (for Mac user) or WinX DVD Ripper Platinum (for Windows user) is your best choice. Why Does HandBrake Save DVD file to M4V not MP4?